Who says Fried Rice has to have rice in it? Well, okay, it does, but in this recipe instead of using rice I experimented with Quinoa, and saying “Fried Quinoa with Chicken” sounds like a completely different dish, so I embellished a bit. 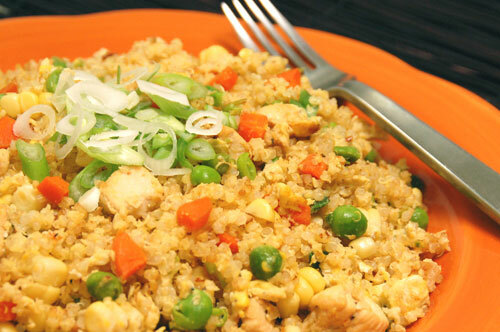 If you cook the Quinoa right, so it doesn’t have the bitter taste that Quinoa can get, this “fried rice” tastes pretty much like the rice version. In fact, I kinda like the Quinoa version better than using brown rice over white rice. Also with Quinoa you get added protein. I have a new fave dish in my repertoire. In this recipe, I also used fresh peas and corn from the cob because I had them in my fridge. I’m all for using the fresh veggies because it’s just the best tasting experience. 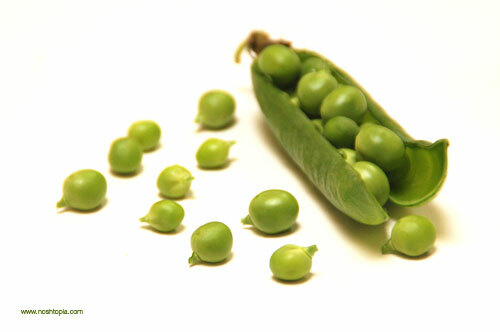 I too, like the slight crunchiness of the fresh peas and corn. But, if you are pressed for time, the frozen veggies work just fine. Cook the Quinoa first and let it stand and cool down. It’s important to let the Quinao sit in its water for at least ½ an hour before you start cooking it so you get no bitter taste. In a saucepan big enough to hold all the Quinoa Fried Rice, heat some oil and then stir fry the chicken until it’s mostly cooked. Add salt & pepper to taste. Add in the carrots, and sautee about a minute with the chicken to start softening the carrots up a bit. Add in the peas and corn and sautee with the chicken and carrots for about a minute. Scramble the eggs in a cup and then pour in with the chicken, carrots, peas, and corn. It is important to cook the scramble eggs before adding in the Quinoa. If you pour the raw egg onto the Quinoa, the Quinoa will get soggy. When the eggs are scrambled, pour in the Quinoa and the green onions along with the soy sauce. Mix all ingredients together well. Let cook in pan, stirring continually for about 1-2 minutes. Put the Quinoa Chicken "Fried Rice" on a platter and serve for noshing!